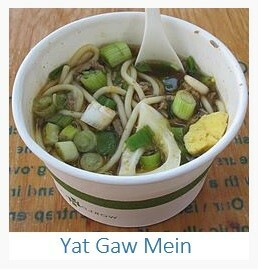 What is Yat Gaw Mein? Yat Gaw Mein is a popular Asian noodle soup with meat and vegetables. More specifically, it is a thick light-colored hot broth with oriental wheat pasta, meat/poultry/seafood and vegetables. It is so popular because it is tasty, low-cost and filling.